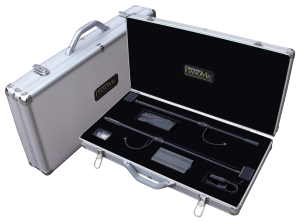 The PM40T Touring PianoMic™ System, offering the features and sonic performance of our PM40 PianoMic™ System while offering quick, simple, and easy setup, in a compact airline friendly carry-on case. The PianoMic™ System was designed to revolutionize piano miking and achieve an incredible improvement in piano sound for live and recording applications with no mic stands or booms. There is more gain before feedback, significantly less leakage from surrounding instruments and the same pristine sound quality with the piano lid either up or down. At the heart of the system are two Random Incidence, omnidirectional, 40 kHz High Definition Microphones™. With a frequency response of 9 Hz to 40 kHz, the mics deliver extraordinary impulse response and extremely short diaphragm settling times. In addition, the microphones exhibit no proximity effect, regardless of their distance from the piano strings or soundboard. The mics, when positioned close to the sound source, also provide incredible gain before feedback.